Did you know you can Smoke Meat Indoors? There are those days when you can't get outside but still want that smoke flavor. 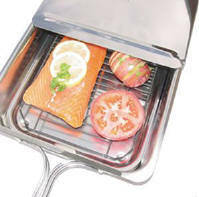 Here is my favorite solution for adding smoke to meat, fish, cheese, vegetables or anything else that you can think of. 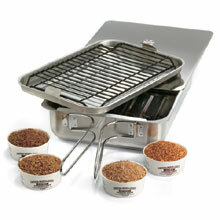 This smoke sits on your stove top and is easy to handle and clean. There are two sizes to choose from as well as an assortment of wood chips. You can use it to add a little smoke flavor and cook in another pan or in the oven to finish. Be creative and have fun. Be sure and line the bottom tray with foil to make cleanup easy. The smokers come with instructions and a small recipe book. I recommend the book below for a more extensive collection of recipes. Solid stainless steel for easy cleanup. Foldable handles. Family size! Comes with sample chips. Solid stainless steel for easy cleanup. Foldable handles. Good for smaller meals. Alder, Hickory, Oak, and Cherry Wood Smoking Chips. Easy size for storing on a shelf. These are fine chips that burn well in the smoker. You only need about a tablespoon to get the desired result. Detailed book with recipes and how to ideas for using your stovetop smoker.